"FUMS" - "F*ck Up My System" - A Process Management Tool. This tool will help you running BoS (and other apps if you like) smoother and stick to the official dev team recommendations (e.g. run your PC in "High Performance" mode) without leaving your system in an undersired state if you happen to do other things than playing IL-2 (which, much to our surprise, sometimes is reported to happen). FUMS consists of 3 files: The Executable (FUMS.exe), a pdb file for debugging, and the settings file (FUMS.ini). FUMS needs admin privileges and it needs .Net Framework 3.5 or later to be installed on your PC (you likely have that already). That's not because we're nasty at you, it's just because otherwise you won't have access to the settings FUMS is meant to adjust. Extract the 3 files to a folder of your choice, open FUMS.ini in a Text Editor and adjust settings to your needs, save FUMS.ini, run FUMS.exe. FUMS runs in "Tray Icon" mode per default. When you double-click on FUMS' Tray Icon (lower right tray area, click the up-arrow if the icon is blanked out), FUMS' window opens up. In order to terminate FUMS, right-click on it's icon and choose "Exit". The FUMS configuration is not really self-explaining, but the ini file contains sufficient information. Don't mess around with things you don't understand. FUMS is called FUMS for a reason. ; there's no need to restart FUMS to apply changes. ; The [Priority] Section holds the desired priorities for certain processes. ; The [Affinity] Section holds the desired processor affinities for certain processes. ; Which either means 8 physical cores or 4 physical cores plus 4 hyperthreading cores. ; An Affinity Mask of "-1" means "use all cores", which is the windows default behaviour. ; The [PowerPlan] Section holds the desired processor affinities for certain processes. ; value it has been on before the first process of this list started. It's written in C# using Visual Studio 2017 if you are keen to know... Express Edition should do (don't ask me, but theoretically it should). 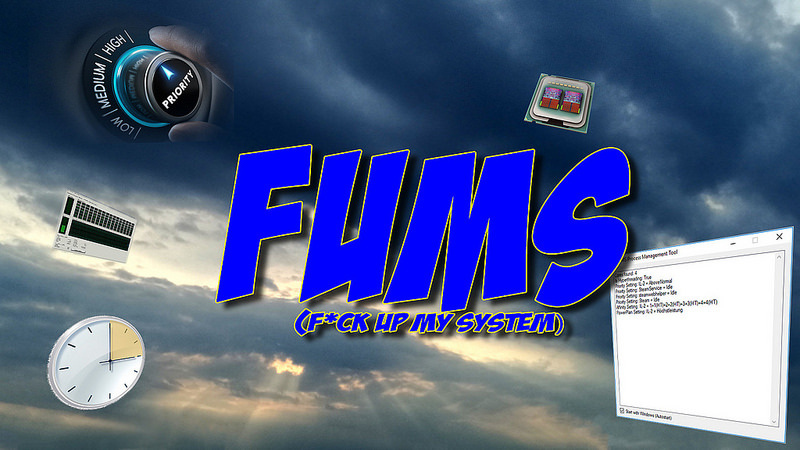 FUMS 1.1 has been uploaded and is available in first post. Fixed an issue where Process Name Dictionaries were case sensitive, resulting in Exceptions thrown when case mismatch between configuration settings and existing process happened. Lol, no idea how that happened, but now the link is there. Awesome work Mike!!!! It does help a lot. My game loads up twice as fast as before, and runs without any problems, on line, off line. Update in first post: FUMS 1.2 has been released. We're not BETA testing anymore, this version is stable. * Autostart function has been adjusted, Scheduled Task starts with 30 seconds delay now to give the Taskbar/Tray a chance to come up before FUMS start. * Tooltip Text for Tray Icon has been adjusted. Please note that due to limitations in XP's Task Scheduler, you need to have Windows Vista or later (7, 8, 10) to use FUMS. I have a major problem with this! System.NullReferenceException: Objektreferensen har inte angetts till en instans av ett objekt. vid System.Windows.Forms.NativeWindow.Callback(IntPtr hWnd, Int32 msg, IntPtr wparam, IntPtr lparam)I get the options to ignore or proceed, clicking proceed repeats the exeption over and over. Looks like you have a custom powerplan active or you have enabled the (hidden) ultimate powerplan. And it turns out that FUMS didn't take that into account yet, so please find an updated version 1.3 in the first post now that should solve this issue. THX a million! That solved my hickups! So would you say your program goes up to... eleven?